Kaspersky have released the beta versions of their next major update, Anti-Virus and Internet Security 2015. One of the major changes reported at their user forums, is the expected return of the Advanced Settings. Advanced settings and real-time reports will be implemented in KIS 2015 MR1 and Pure 4.0, which are expected to be released in the summer. They have also confirmed that users will not need to download new beta versions, and the application will update itself. They are planning to add incremental updates to the beta versions, based on user feedback. I would not recommend installing the beta versions on your primary computer, as they could be unstable. 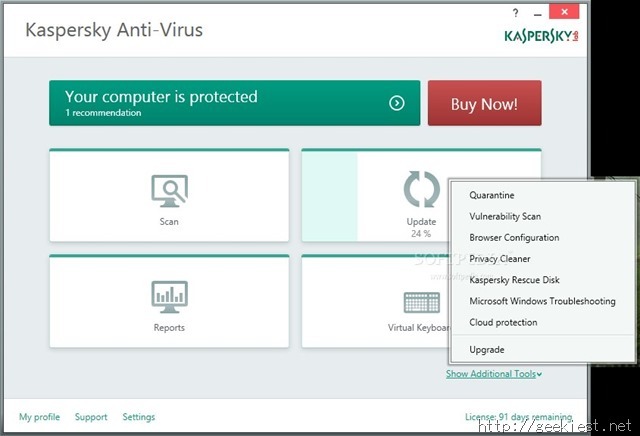 You can download the current versions of Kaspersky Anti-Virus and Internet Security 2015 Beta from the official page. To download future versions, you can head over to this page. I am unsure about the validity duration of the beta program, but I can safely say it may be a 30-day trial period.